This comprehensive text not only covers basic principles of horseshoeing, but also focuses on medical and surgical foot care management. 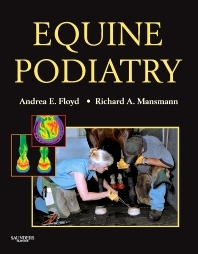 Starting with the anatomy and physiology of the equine foot, this one-of-a-kind book then evaluates the foot, its pathological conditions (including structural, developmental, and traumatic conditions in addition to laminitis), balancing and shoeing the healthy and diseased equine hoof, and ends with a chapter on new directions in equine podiatry, written by cutting-edge researchers in the field. Written by and for both veterinarians and farriers, this book makes it easier for veterinarians and farriers to collaborate on the proper care and shoeing of the horse's foot. Text is devoted entirely to equine podiatry — with 70 percent to 80 percent of lameness problems involving the foot, this comprehensive discussion is invaluable to the equine practitioner. Highly respected and qualified authors from all over the world provide expert information, along with a chapter on the future of equine podiatry. Beautiful 4-color design and art program gives the reader helpful visual aids that clarify explanations in the text.